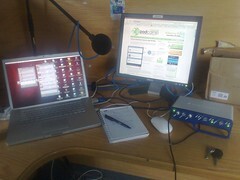 I meant to get this posted to the blog a week ago or so – my podcasting set up for the Wednesday morning call for PodCamp Ireland. In the run up to PodCamp on the 27th in Kilkenny (this month) myself, Bernie Goldbach and Krishna De have been chatting every Wednesday morning at 9am for a one-hour podcast show. There’s regular interviews, some banter between ourselves, a hosting/domain tip from Blacknight’s Michele Neylon and a few other bits thrown in for good measure. So while you might hear me on a Wednesday morning, this is what I’m looking at in one corner of my office. Note: the description was actually in the flickr profile but the jist of what you’re looking at (outside of the laptop and second monitor) is a shielded Shure SM58 (stand cut into the desk) feeding through a Digidesign Mbox 2, connected via USB to the MacBook Pro. All audio for the MacBook on the call is routed through the Mbox, allowing me to use the SM58 with Skype.